A system, for facilitating the determination of property and casualty insurance rates, is accessible by users as a desktop application or across a computer network, such as via a web site on the Internet. 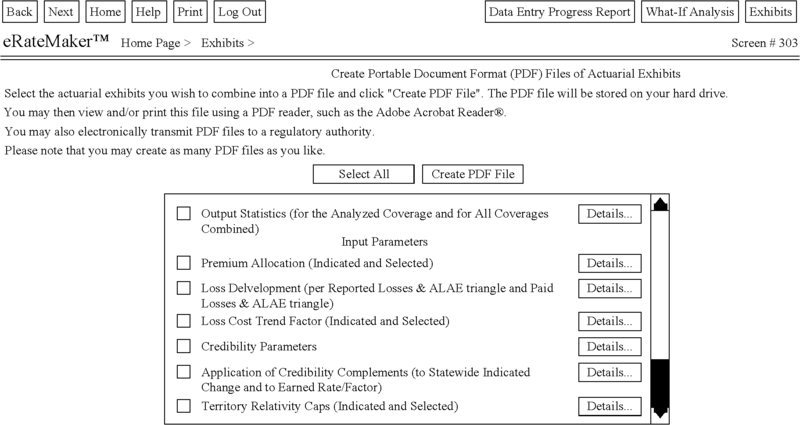 Each user can provide ratemaking data, in any flat-file format, to a computer or computer server, view and correct data entry errors found in the policy and claims databanks, perform sensitivity analyses, review a log of the input ratemaking parameters and the output rate level information that comprise each sensitivity analysis, review the effect of modifications to the system's default ratemaking parameters, select final input ratemaking parameters, and receive as a product of the system, insurance rates and actuarial exhibits. FIGS. 1A to  1D are schematic block diagrams illustrating Alternative Computer Networks and their interaction with the ratemaking computer program. FIG. 14 is a flow diagram of the Exhibits Subroutine which pertains to the viewing and creation of portable document format (PDF) files. 3. the ratemaking computer program  102 that resides on the computer server 101. The preferred embodiments to this invention are the third and fourth illustrated cases, FIGS. 1C and 1D, that include the Internet  103. The user's communication device 100 needs only have enough processing circuitry, input/output devices, and peripheral equipment so that it can communicate with the computer server 101 either directly, or indirectly via a network 103, 104, 105, or 106. FIG. 2 is a high-level flow diagram of the ratemaking routine. After the user logs in and agrees with the license agreement  107, he uploads 109 his Policy and Claims Underwriting Experience 108 into the system. He then identifies the fields of data in his databanks, corrects detected errors, and selects the insurance coverages he wants the computer ratemaking program 102 to analyze 110. After additional ratemaking data are entered 111, the computer ratemaking program 102, using conventional actuarial algorithms, processes 112 all the data. The algorithms, that are interlinked and recursive, generate the initial values for certain critical ratemaking parameters 113. The initial values, in turn, are fed into, and processed 114 by, additional conventional actuarial algorithms. Insurance rates and actuarial exhibits 115 are automatically generated for the user's review once all the data are entered. The user has access to a “What-If” subroutine 116 that allows him to test the sensitivity of the generated rates to variations in the input ratemaking parameters 117. New rates 115 are automatically generated for each new saved set of input ratemaking parameters 117. When the user is satisfied with the calculated rates 115, he can create Portable Document Format (PDF) files 118 for printing 119, storing, and electronic transmission to a regulatory authority. The user logs out at 120. The user's operation begins with the “Log In” subroutine, FIG. 3. The user logs in  121, with a username, the applicable State, a password, and the pre-approved static Internet protocol (IP) address. When all the “log in” items are authenticated, the license agreement 122 is displayed. If the user agrees 123 with the agreement, he moves on to the “Home Page” 124; otherwise, the user is routed back to the “Log In” page where he is provided with the licensor's email address and telephone number. 3. review and administer the actuarial “Exhibits”  127. 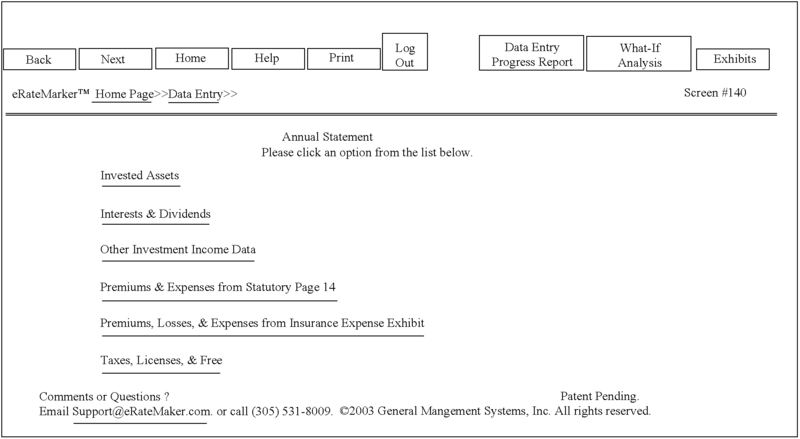 The web page navigation bar, entitled “Data Entry Progress Report”, as shown in Table 2 provides the user with continuous and immediate access to his data entry progress  134. Table 3 is an exemplary web page of a Data Entry Progress Report. The web page provides a status report, as to what data have been entered, and links to every data entry web page. The checkboxes to the left of each category are check-marked by the ratemaking computer program once all the data, for the particular category of data, have been entered. 3. Coverages to Analyze  137. As diagrammed in FIG. 5, the user uploads, to the web-based ratemaking computer program, his policy  135 and claims 136 databanks, if he has not uploaded them in a previous session. He locates his files, through his communication device, by browsing, as illustrated in the web page shown as Table 5. The user's first task, after he has uploaded  138 the new databank 139, is to identify the columns of data. If he has already identified each column in a previous session, he can select from a drop-down list, the name he assigned for the “Databank Column Specifications”, as shown in Table 6. If such specifications have not been established, named, and saved, his first task is to stipulate how the columns of data are delimited. 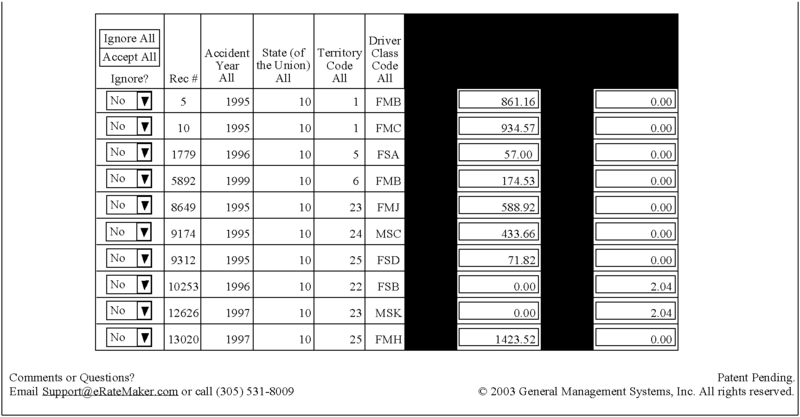 The ratemaking computer program inserts vertical lines between each column of data, as shown in Table 6, once it is told what the column delimiter is. 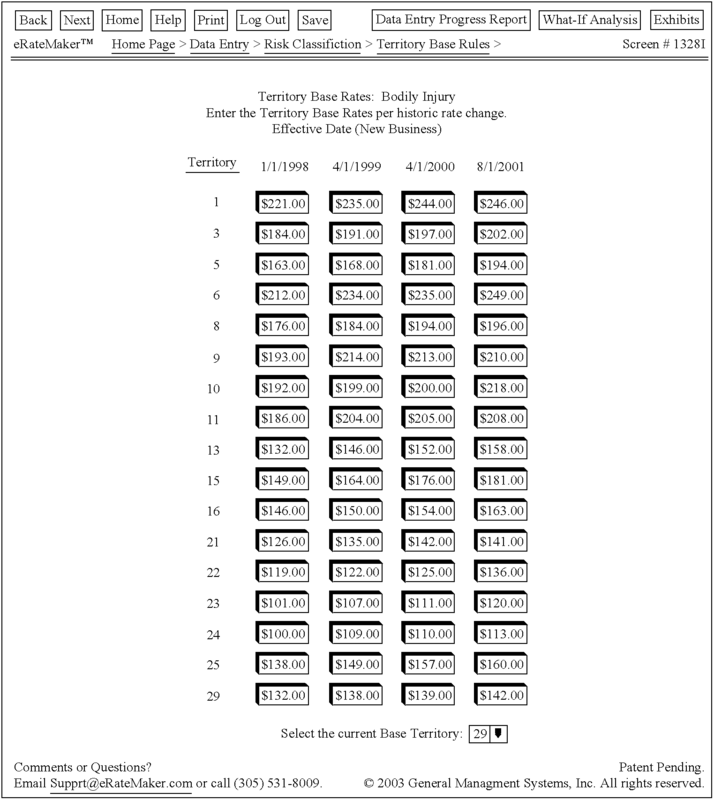 As illustrated, the columns in the databank are numbered by the ratemaking computer program, serially, for as many columns as there are in the databank, beginning with the number “1”. If the columns are fixed in width, the user must enter the number of columns 140, and the width of each column 141. If the delimiter is not represented by an option button, the user must enter the “another character” 142 before the vertical lines can be inserted between the columns of data. Next, the user must identify the content of each column. He accomplishes this task  143, by way of drop-down lists. Next the user indicates how many lines of non-applicable data  144, if any, precede his first row of underwriting experience. He does this by way of a textbox as shown in Table 6. A default value, equal to “0”, is provided by the program. The user's next task is to select, from a drop-down list box, as shown in Table 6, the character  145 that he may have in his databank, which identifies any text that his databank may contain. 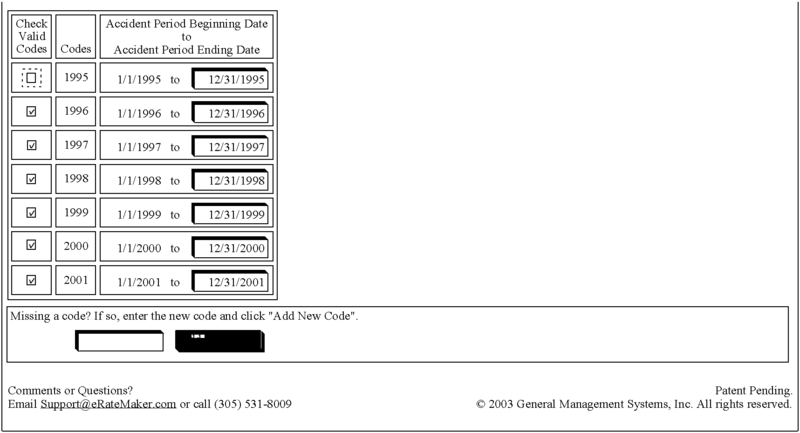 The ratemaking computer program next displays the “Pending Tasks”  146, as illustrated in Table 7, an exemplary web page. Columns of data will have codes that the user must identify 147 and coverage data may have data entry errors that the user may want to correct 148. The web page provides links to the codes that were found in the databank  149. Table 8 is an exemplary web page for the codes that were found in the “Accident Year” column of an exemplary databank. The user, with the aid of drop-down lists and textboxes, identifies 147 the codes. Each drop-down list provides a list of all the possible identities for the codes that were found in a selected column. The user also has the ability to indicate which codes found in the databank are invalid; and the ability to add valid codes which were not found in the databank. The exemplary web page displayed as Table 7 also provides links to the lines of data with errors. The errors are sorted by insurance coverage. The user clicks on the described error to see a list of the lines of data with errors. Table 9 is an exemplary web page of detected errors. The first column, for each line of data, provides the user with a drop-down list box to “Ignore” or “Not Ignore” the line of data. If the user elects not to ignore the line of data, he is required to correct the error in a textbox  148. 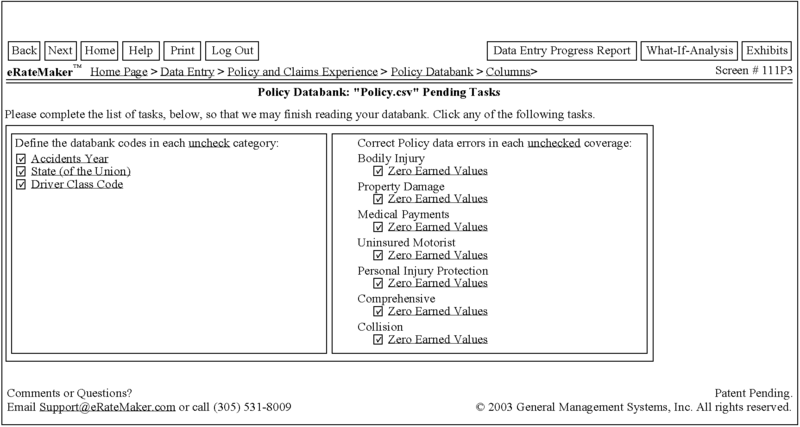 The last task that the user must complete in this first data entry subsystem, (“Enter Policy and Claims Experience”), is to indicate which insurance coverages he would like the ratemaking computer program to analyze. This is accomplished by way of option buttons  137 as illustrated in the exemplary web page shown as Table 11. 3. Administrative Expense Fees  152. 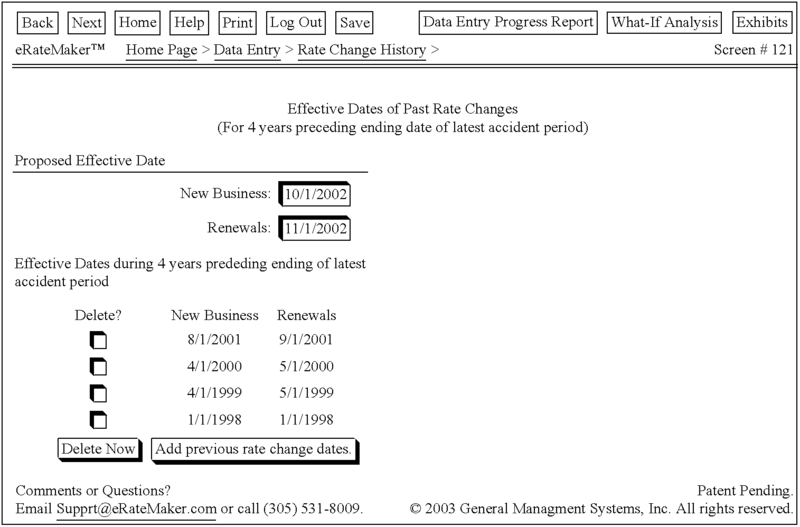 The “Effective Dates of Past Rate Changes” section accepts the effective dates  150, for “New Business” and “Renewal Business”, for all rate changes made during the four years preceding the ending date of the latest accident year, as illustrated in the exemplary web page shown as Table 13. 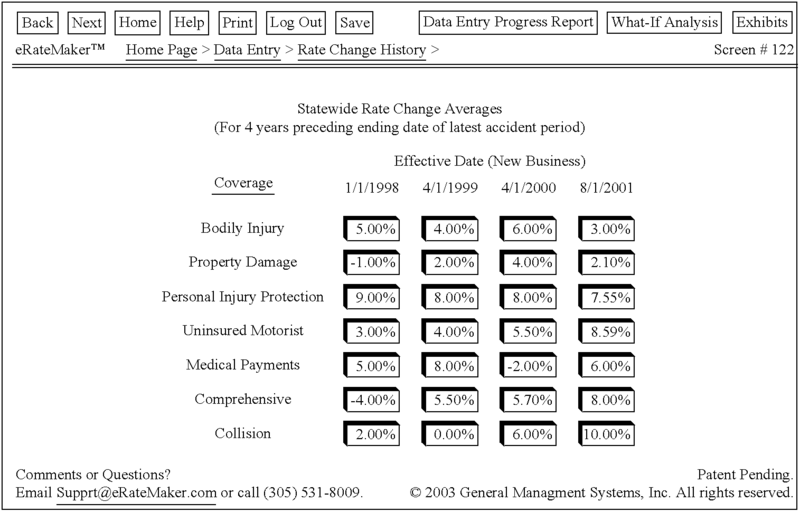 The “Statewide Rate Change Averages” section accepts the recent average statewide rate change (percent increase or decrease), by coverage, for each rate change  151 made during the four years preceding the ending date of the latest accident year, as illustrated in the exemplary web page shown as Table 14. 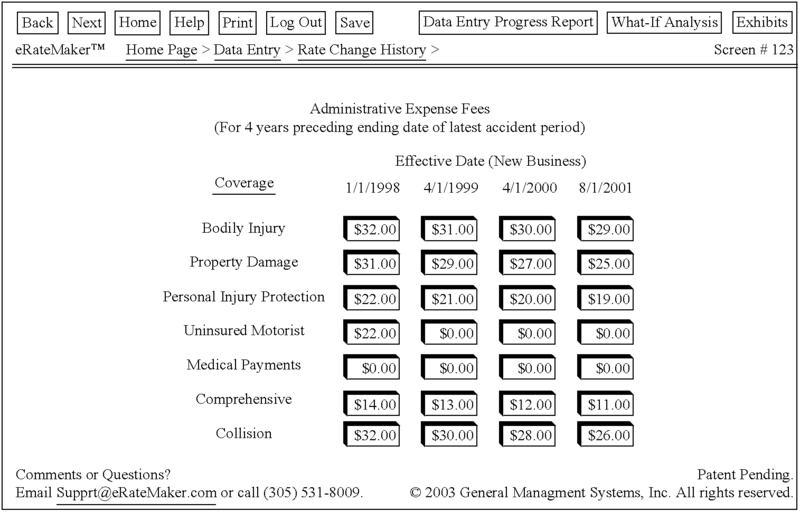 The “Administrative Expense Fee History” section accepts the recent history of the fees charged, if any, for each coverage, for each rate change  152 made during the four years preceding the ending date of the latest accident year, as illustrated in the exemplary web page shown as Table 15. 3. Driver Class Relativities  155. 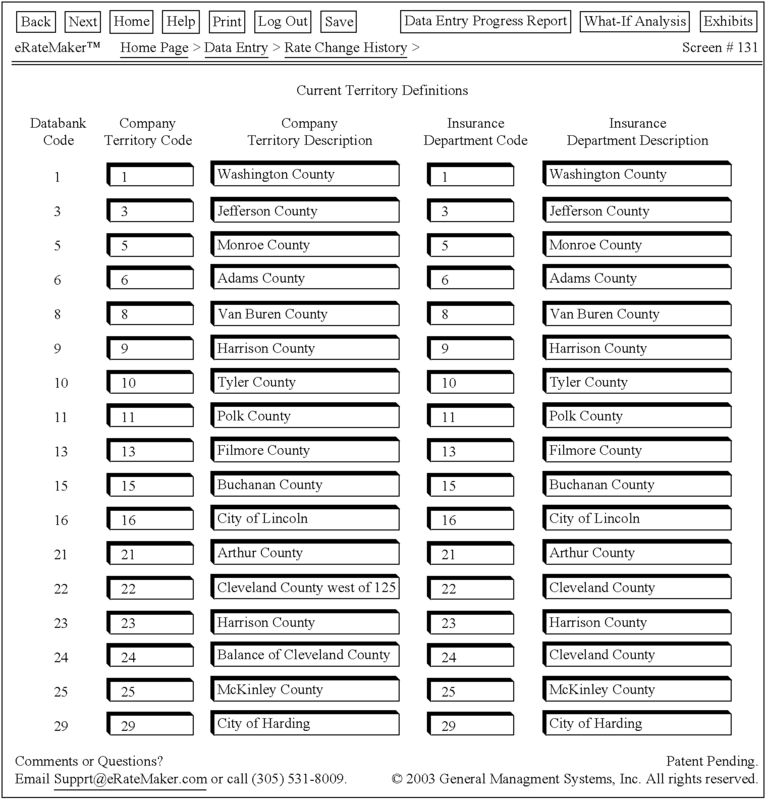 The “Current Territory Definitions” section accepts identification codes, names, and zip codes when applicable, for each rating territory  153, as illustrated in the exemplary web page shown as Table 17. The “Territory Base Rates” section accepts the recent history of the base rates for each territory, by effective date  154, as illustrated in the exemplary web pages shown as Table 18 and Table 19. 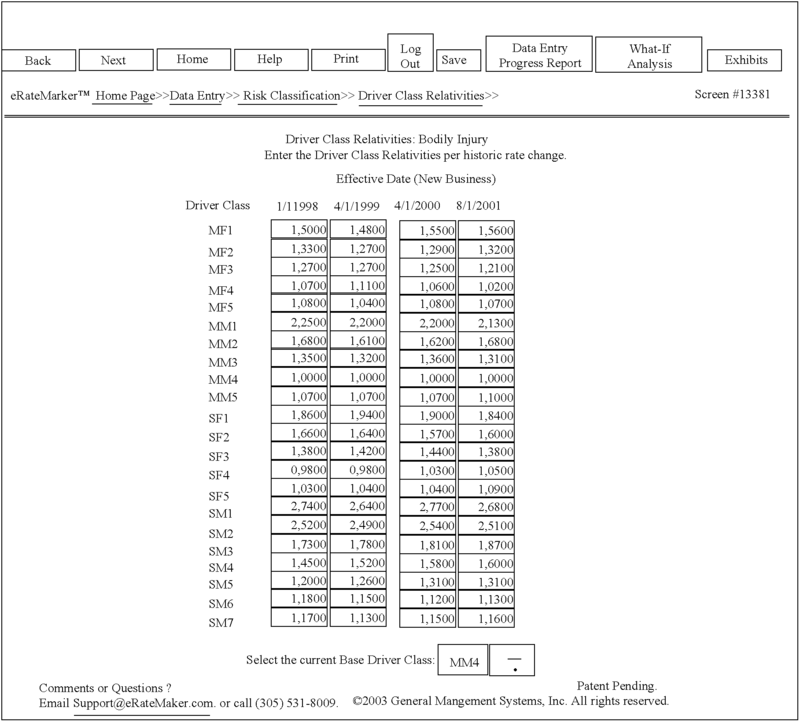 The “Driver Class Relativities” (by coverage) section accepts the recent history of the relativity factors for each driver class, by effective date  155, as illustrated in the exemplary web pages shown as Table 20 and Table 21. 6. Taxes, Licenses, & Fees  161. 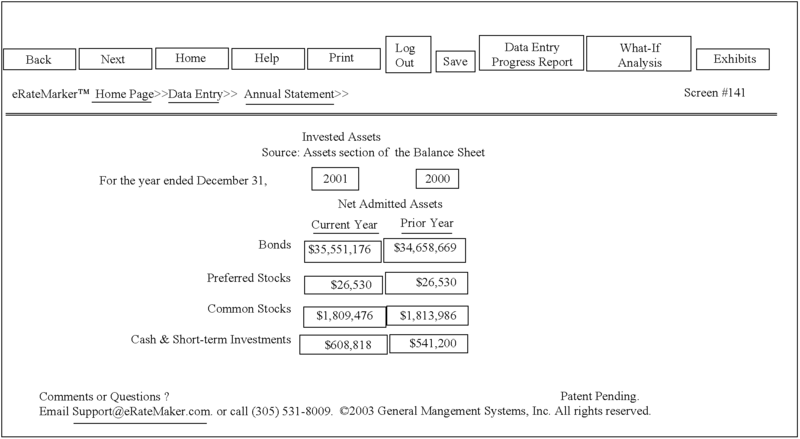 The “Invested Assets” section accepts the investment portfolio values for stocks, bonds, and cash, for December 31 of the latest two years  156, as illustrated in the exemplary web page shown as Table 23. 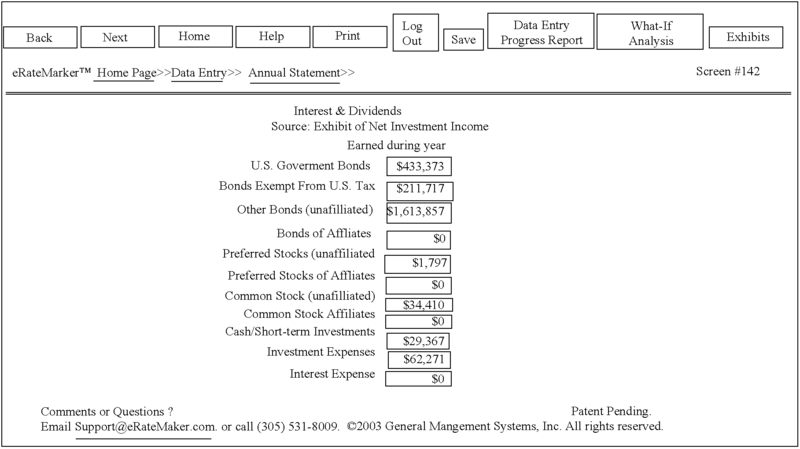 The “Interest & Dividends” section accepts the investment income earned by type of investment, and investment expenses incurred, for the latest fiscal year  157, as illustrated in the exemplary web page shown as Table 24. 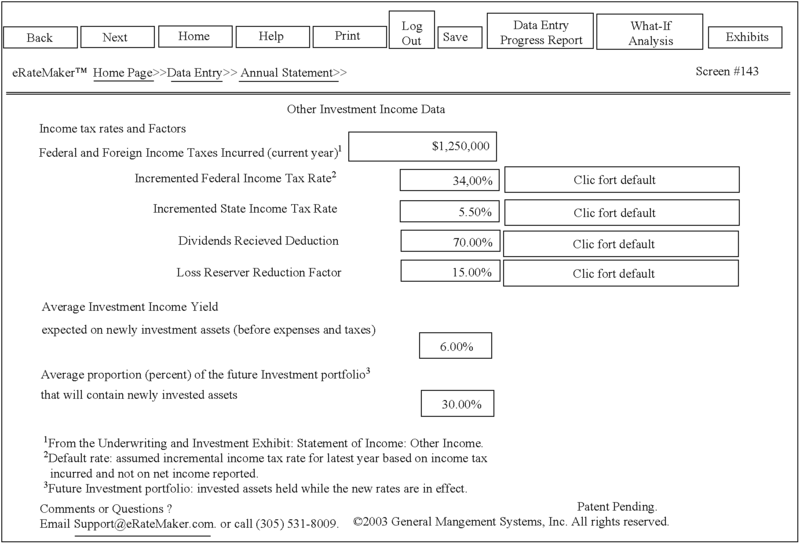 The “Other Investment Income Data” section accepts current income tax rates and factors, and projections that apply to invested assets  158, as illustrated in the exemplary web page shown as Table 25. Default values are offered. 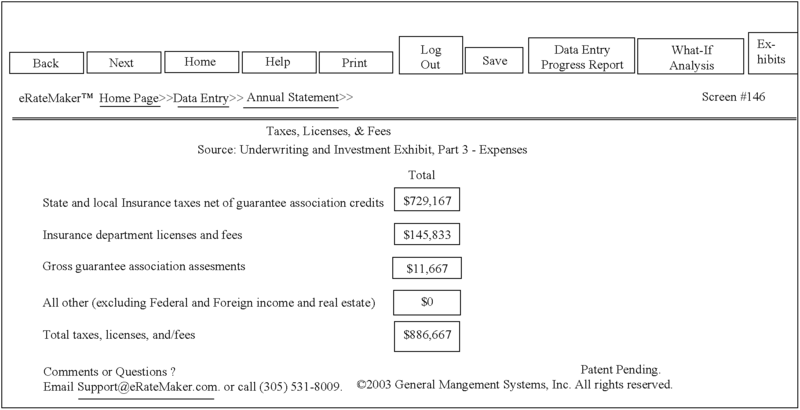 The “Premiums & Expenses from Statutory Page 14” section accepts premiums written and earned, and certain expenses incurred, for the latest fiscal year, by line of business, for the State in which the rates are being filed  159, as illustrated in the exemplary web page shown as Table 26. 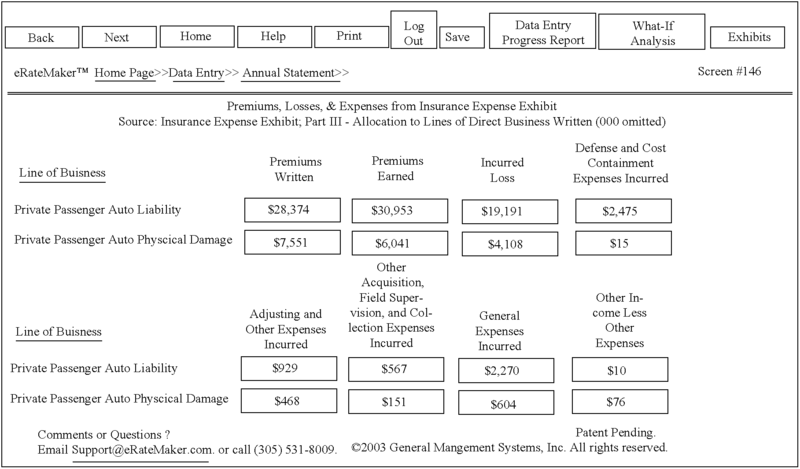 The “Premiums, Losses, & Expenses from Insurance Expense Exhibit” section accepts premiums written and earned, and certain expenses incurred, for the latest fiscal year, by line of business, on a countrywide basis  160, as illustrated in the exemplary web page shown as Table 27. The “Taxes, Licenses, & Fees” section accepts such expenses for the latest fiscal year  161, as illustrated in the exemplary web page shown as Table 28. 8. Coefficient of Variation  169. 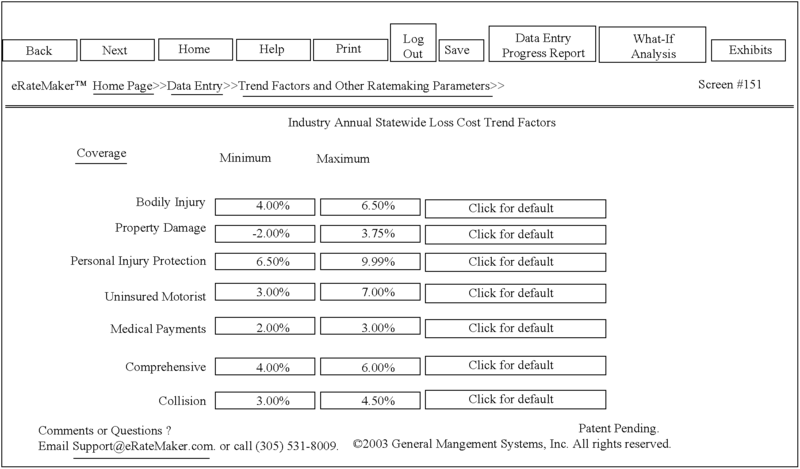 The “Industry Annual Statewide Loss Cost Trend Factors” section accepts the minimum and maximum annual trend factors that the ratemaking computer program considers in projecting average claim costs  162, as illustrated in the exemplary web page shown as Table 30. Default values are offered. 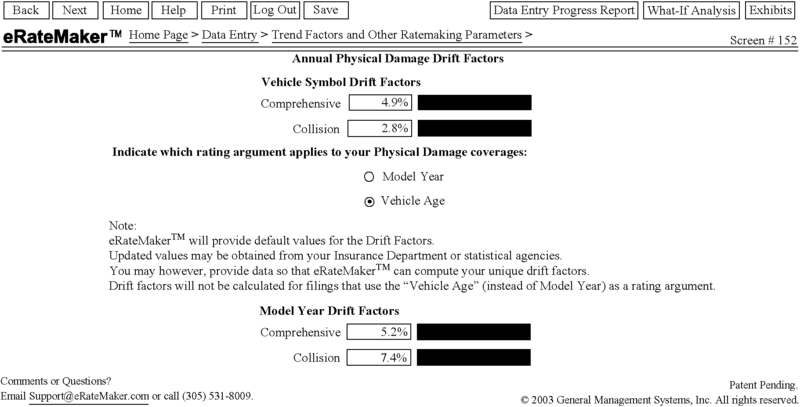 The exemplary “Annual Physical Damage Drift Factors” section accepts estimates of the annual drift factors for Vehicle Symbols and Vehicle Model Years for the Comprehensive and Collision insurance coverages  163, as illustrated in the exemplary web page shown as Table 31. (Vehicle Symbols and their assigned premium relativity factors measure, primarily, the original price of the car; Vehicle Model Years and their assigned premium relativity factors take into account, primarily, the depreciation of the car.) Default values are offered. The “Allocated Loss Adjustment Expense (ALAE) as a percent of LAE” section accepts the user's estimate of allocated loss adjustment expenses as a percent of total loss adjustment expenses  164, as illustrated in Table 32. Default values are offered. The “Allocation of Administrative Expenses” section accepts the percentage of certain administrative expenses that do not vary with the premium charged  165. Such expenses are fixed and charged as a fee. They include: Other Acquisition Expenses, Miscellaneous Licenses & Fees, General Expenses, and Other Special Expenses. Default values are offered. Table 33 is an exemplary web page that the user employs to enter the percentages. 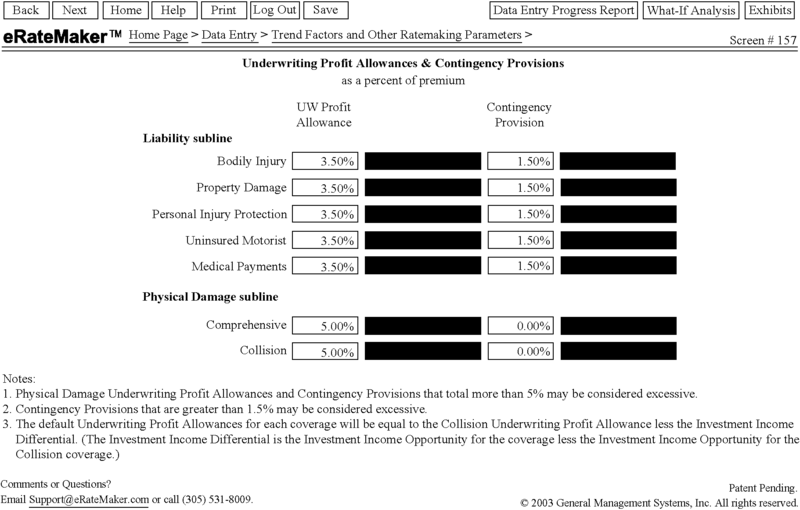 The “Expected Loss Payment Patterns” section accepts the expected cumulative percent of losses paid at of the close of each accident year  166, as illustrated in the exemplary web page shown as Table 34. Default values are offered. 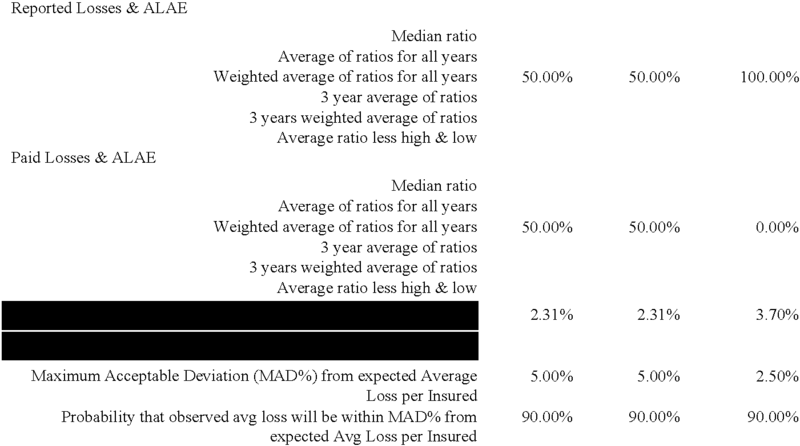 The “Catastrophe Reinsurance Costs” section accepts when applicable, the cost of catastrophe reinsurance as a percent of the exemplary Comprehensive coverage earned premium  167, as illustrated in the exemplary web page shown as Table 35. 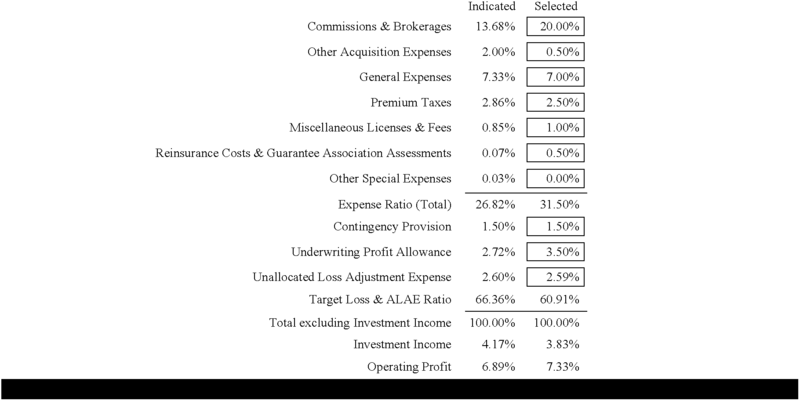 The “Underwriting Profit Allowances & Contingency Provisions” section accepts the user's target profit allowance (as a percent of premium) and a contingency provision (as a percent of premium)  168, as illustrated in the exemplary web page shown as Table 36. Default values are offered. The “Coefficients of Variation” section accepts, for each coverage, a coefficient, which represents the ratio of the standard deviation of the “cost per claim” to the average “cost per claim”  169, as illustrated in the exemplary web page shown as Table 37. Default values are offered. 2. Rate Filing Transmittal Form  171. The “Mix of Business” section accepts the current and expected percent distributions of premium earned, by policy term  170, as illustrated in the exemplary web page shown as Table 39. 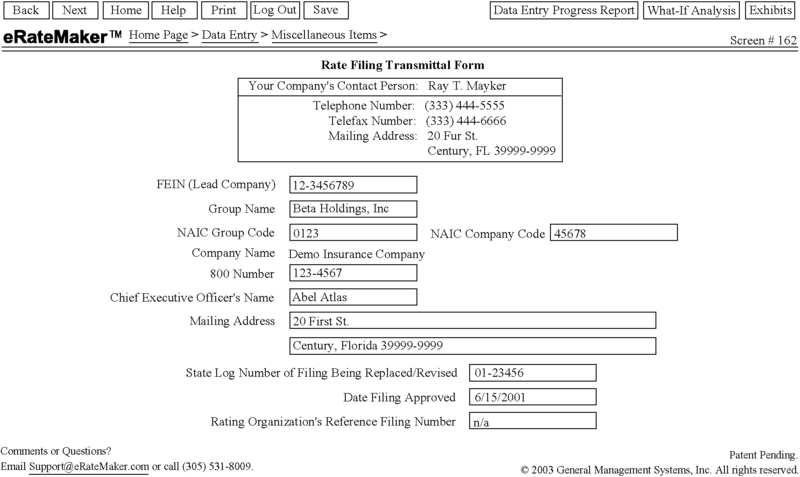 The “Rate Filing Transmittal Form“section accepts identification data pertaining to the insurance company, contact personnel, and the filing  171, as illustrated in the exemplary web page shown as Table 40. The initial assumptions are default values that the computer ratemaking program generates; while succeeding assumptions  173 are values that the user provides. 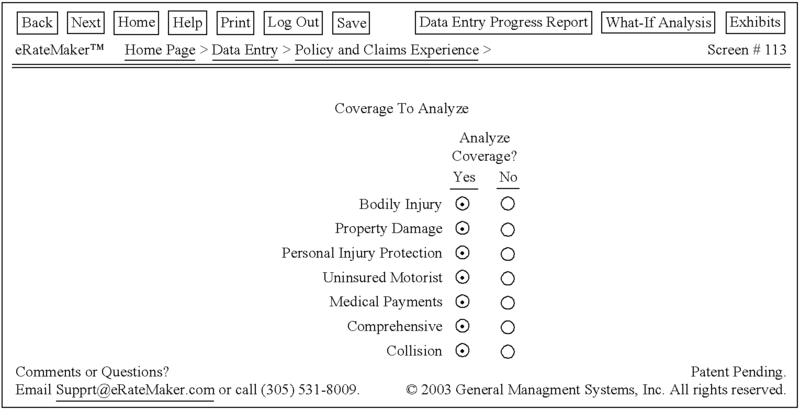 “What-If” analyses are conducted separately on each insurance coverage 174 as indicated in the exemplary web page shown as Table 42. The user changes the input ratemaking parameters  172 by way of text boxes, options buttons, and list boxes that are linked to the input parameters 172. Buttons to view a log (“What-If” Notebook) of all the saved analyses, to generate (“Calculate”) new rates and exhibits, and to save new analyses 176 are provided. An exemplary web page of the “What-If Notebook” is shown as Table  44 and illustrated by way of a flow diagram in FIG. 13. The user can save 176 and compare any and all of the “What-If” analyses before selecting a final set of ratemaking parameters. All the output statistics and input ratemaking parameters are stored and displayed in the “Notebook”. Every time the user selects 177, in the Notebook, a saved set of ratemaking parameters, a new set of output statistics and actuarial exhibits are generated 178. The “What-If Notebook” displays two loss ratios for each “What-If” analysis: (1) the “Expected Loss & ALAE ratio” if the ratemaking computer program's parameters are assumed and (2) the “Target Loss & ALAE ratio” if the user's input ratemaking parameters are assumed. The parameters determined by the ratemaking computer program are assumed to be the most actuarially sound. A user may modify the ratemaking parameters in an attempt to meet competition's rates or justify, to a regulatory authority 179, a rate change that is either higher or lower than what is actuarially sound. The first loss ratio is an attempt to measure the consequences of such modifications. (“Loss & ALAE ratio”, as used in this discussion, is the ratio of projected claims and loss adjustment expenses to earned premiums). The user also has the ability to delete  180 saved analyses from the What If Notebook. A search routine allows the user to view the exhibits by insurance coverage  186 or alternatively, the coverages by type of actuarial exhibit 187. An exemplary actuarial exhibit is presented in the exemplary web page shown as Table 47. Bulk printing and storage of selected exhibits is accomplished by converting the exhibits to portable document format (PDF) files  182. The PDF files can be stored on the user's computer, and then printed and/or electronically transmitted to his regulatory authority. 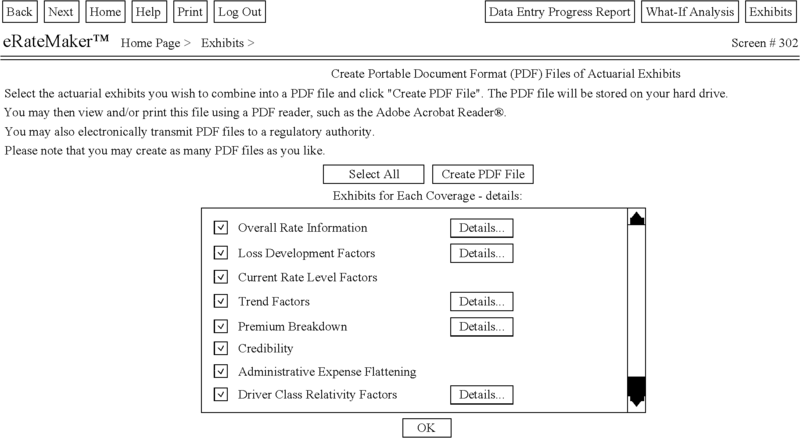 The user selects the exhibits that he wants included in each PDF file, accepts or enters a default name for each file to be created and points to an output folder, on his computer, where the files are to be stored. 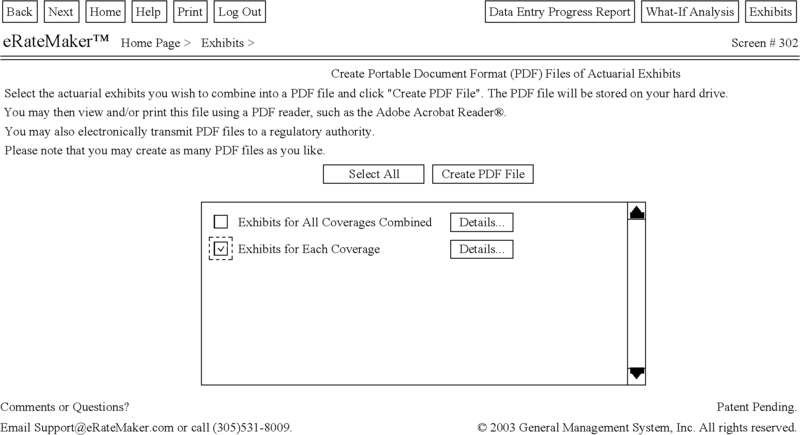 Web pages, that the user activates to create PDF files, are shown as Table 48 through Table 51. Table 48 is the-web page that the user employs to select and create PDF files of actuarial exhibits, for all the insurance coverages combined, or for each coverage separately. Should the user not want all the available actuarial exhibits, he can click on a “Details” command button. 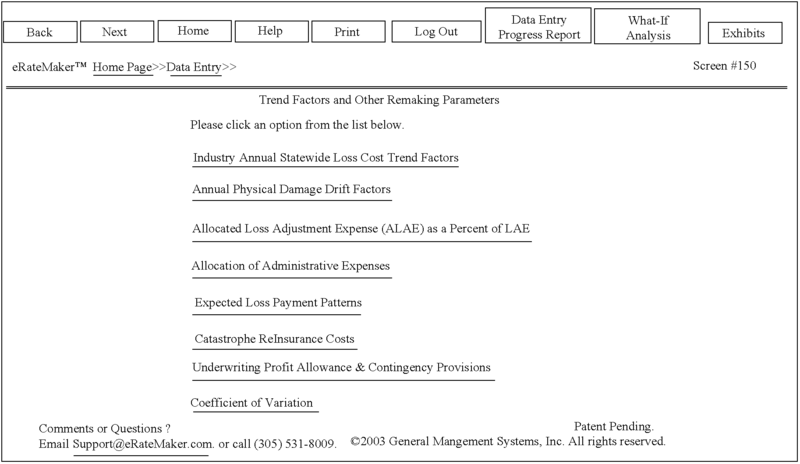 As shown in Table 49, an exemplary web page, the button provides a list of the different categories of actuarial exhibits. Should the user not want all the available actuarial exhibits within a category, he can, once again, click on a “Details” command button which will provide a list of the actuarial exhibits within the category. Similar features are provided for the “What-If Profiles” exhibits (Table  50 ) and the data entry exhibits (Table 51). You may then view andlor print this file using a PDF reader, such as the Adobe Acrobat Reader ®. You may also electronically transmit PDF files to a regulatory authority. Please note that you may create as many PDF files as you like. for receiving from the computer server, the rates and the actuarial exhibits. 2. The system for facilitating the determination of property and casualty insurance rates of claim 1, wherein the computer network is a wide area network. 3. The system for facilitating the determination of property and casualty insurance rates of claim 1, wherein the computer network is the Internet; the computer server is coupled to the Internet and the computer server operates with a web server to provide the at least one user access to the system for facilitating the determination of property and casualty insurance rates. 4. The system for facilitating the determination of property and casualty insurance rates of claim 1, further comprising a local area network coupled to the communication device and to the Internet wherein the computer network is the Internet; and the computer server is coupled to the Internet to provide the at least one user access to the system for facilitating the determination of property and casualty insurance rates. 6. The method of claim 5, wherein the at least one user sends ratemaking data to a computer server via the Internet. 7. The ratemaking method as claimed in claim 5, wherein the ratemaking data comprise any flat-file database of insurance policy and claims data. accepting changes to the data entry errors. 10. 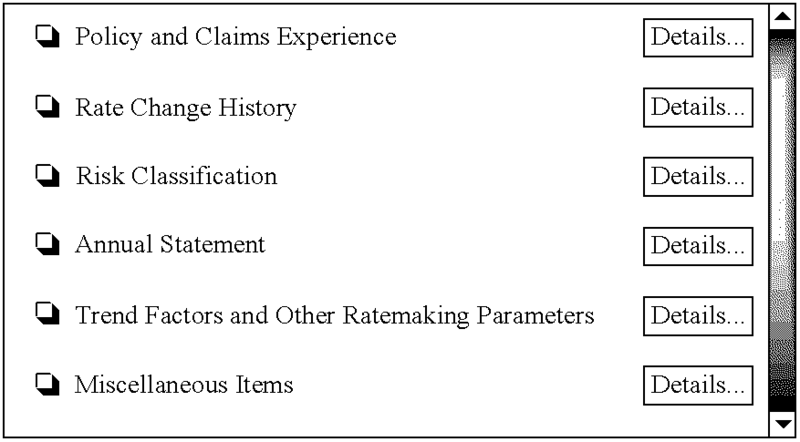 The ratemaking method as claimed in claim 5, comprising the further steps of providing default values pertaining to insurance industry averages or insurance industry trends. 11. The ratemaking method as claimed in claim 5, comprising the further step of providing a data entry progress report. 12. The ratemaking method as claimed in claim 5, comprising the further step of providing a sensitivity analysis model comprising input ratemaking parameters and output rate level information. 13. The ratemaking method as claimed in claim 12, comprising the further step of providing a log for displaying the input ratemaking parameters and the output rate level information. 14. The ratemaking method as claimed in claim 13, comprising the further step of selecting concluding input ratemaking parameters by the at least one user. 15. The ratemaking method as claimed in claim 12, comprising the further step of providing an actuarial measure of the effect caused by a modification of default input ratemaking parameters. 16. The ratemaking method as claimed in claim 5, comprising the further step of providing rates and actuarial exhibits. 17. The ratemaking method as claimed in claim 5, comprising the further step of storing the ratemaking data for future ratemaking projects. 18. The ratemaking method as claimed in claim 17, comprising the further step of appending new policy and claims data to the ratemaking data.